Conforming loans are underwritten to a standardized set of guidelines, have size limits that vary by U.S. region, and can be purchased by Fannie Mae and Freddie Mac. “Fannie” and “Freddie,” the Federal National Mortgage Association and the Federal Home Loan Mortgage Corporation, set the guidelines for conforming loans. All loans underwritten to these guidelines are said to conform to the rules Fannie Mae and Freddie Mac set. Because conforming loans can be sold to Fannie Mae or Freddie Mac, they offer the lowest interest rates and best terms available. Congress established these two agencies to facilitate residential lending by buying mortgages from lenders. Each year the Federal Housing Finance Agency, which governs Fannie Mae and Freddie Mac, sets conforming loan limits. Fannie and Freddie can purchase loans up to these limits. For many years, the conforming loan limit for a single family home (house or condo) was $417,000. In 2016 it was increased to $424,100. Starting in 2018, the new limit is $453,100. In 2008 a new category of conforming loans, called “high-balance” or “agency jumbo” conforming loans, was created to accommodate markets where housing is more expensive such as the Bay Area. Unlike traditional conforming loan limits which are uniform across the nation, high balance limits vary according to housing costs in each region of the country. In the Bay Area, the maximum amount for these loans is the highest in the nation. Starting in 2018, the limit was increased to $679,650. A separate set of guidelines govern this category of conforming loans — guidelines that are slightly stricter than those for traditional conforming loans. The “high-balance” loans also generally carry interest rates that are around .25 percent higher than standard conforming loans. <= $453,100 Fannie Mae/Freddie Mac are allowed to purchase loans up to this maximum amount. > $453,100 <= $679,650 Fannie Mae/Freddie Mac can also buy these larger conforming loans, though slightly stricter guidelines apply. Rates are generally .25 percent above standard conforming loan amounts. The loans Fannie Mae and Freddie Mac purchase are ultimately packaged into mortgage-backed securities and sold on the open market to investors. Investors are willing to buy these securities because they come with an implicit guarantee from Fannie and Freddie. The market assumes the government will step in to cover any losses if needed – an assumption that proved correct during the 2008 mortgage crisis. That relatively low level of risk encourages investment in mortgage-backed securities made up of conforming loans. This, in turn, encourages lending. Lenders like to make conforming loans because they can be sold to Fannie Mae and Freddie Mac and packaged into securities. After the loans are sold, they receive a fresh supply of cash to make new loans. >$679,650 Fannie Mae/Freddie Mac aren’t allowed to purchase loans above this amount. Interest rates are generally higher than for conforming loans and guidelines more restrictive. Jumbo loans play by a different set of rules — they needn’t conform to Fannie Mae and Freddie Mac loan limits or underwriting guidelines. In more expensive markets like San Francisco, jumbo loans remain essential for many buyers. Without them, down payments need to be very large. Rates for jumbo loans almost always run higher than those of conforming loans. Still, the difference in rate isn’t set in stone. Instead, it depends on many variables, including the price lenders can get from private investors in the secondary market. Jumbo loan guidelines often vary widely among lenders. If you need jumbo financing, it’s important to work with someone like me, who knows the guidelines inside out and has access to a range of jumbo lenders. Without a broker’s help, you may hit a wall – even when the financing you’re looking for is entirely doable with a different lender. All loans have a rate that’s either fixed or adjustable. Rates for fixed-rate mortgages remain the same throughout the entire term of the loan, while those for adjustable-rate mortgages, or ARMs, stay fixed for only the first few years of the term and then adjust according to a formula. This initial ARM period can be as short as one month or as long as 10 years. Because no one knows how long they’ll be in their home, many borrowers opt for a fixed-rate mortgage. Rates for fixed mortgages run higher than those for their adjustable-rate counterparts because they’re locked in for the life of the loan, regardless of market conditions. Fixed-rate mortgages are available with either 15- or 30-year terms. Fifteen-year fixed loans carry a lower rate but a higher monthly payment than their 30-year counterparts, since they require a quicker repayment schedule. Conversely, 30-year fixed mortgages require higher rates and lower monthly payments, making them accessible for a greater number of borrowers. That’s why most loans are based on a 30-year term. In recent years, adjustable-rate mortgages have gained a bad reputation thanks to their connection with the mortgage crisis. While it’s true that dramatic rate increases on certain types of adjustable-rate loans led to mortgage defaults, the ARMs available today differ significantly from their 2008 brethren. Depending on your circumstances, an adjustable-rate mortgage may be the right choice for you. ARMs tend to work well for borrowers who plan to move or refinance with a few years, since their rates generally run lower than fixed-rate mortgages. That’s because ARM rates are guaranteed for just the first few years of the loan. If you’re certain you won’t be in your home or have your loan beyond a certain date, it doesn’t make sense to take on the higher rates of a fixed-rate mortgage. Adjustable-rate mortgages also work well for buyers struggling to qualify for a purchase price high enough to compete in their market. Since the rates and monthly payments are lower, an ARM may help you qualify for that heftier purchase price. Interest rate is fixed for the entire term of the loan. Monthly payment will never change. Interest rate is fixed for an initial period and then adjusts periodically based on a formula. Interest rate is usually lower than for fixed-rate mortgages. Works well for borrowers who don’t plan to stay in their property long term. The most popular ARMs available have fixed rates for the first three, five, seven, or 10 years. After that period, the interest rate adjusts once every six months or year according to a formula. Most adjustable-rate mortgages are based on the London Interbank Offered Rate, or LIBOR, index. It’s the rate bankers in London charge each other to borrow funds on a short-term basis. The LIBOR index is quoted on either a six-month or one-year basis. Your loan index will be tied to either the 6 month or 1 year LIBOR index. Adjustable-rate mortgages also have a “margin” associated with them. The margin for your loan is a fixed percentage and is added to the index to calculate your rate when it begins adjusting. Most adjustable-rate mortgage margins are between 2.25 percent and 2.75 percent. ARMs also carry periodic and lifetime “caps,” which limit how high or low the interest rate can go during your loan’s adjustable period. For example, most ARM interest rates can’t increase more than 5 percent above where they start, regardless of how high the underlying index has risen; if your initial rate was 5, it will never go above a lifetime cap of 10 percent. In example #2 the interest rate cap came into play. According to the formula the rate should have adjusted to 10.75% but was limited to just 10%. That’s because the rate started at 5% and was limited to an increase of no more than an additional 5% over the life of the loan. Periodic limits may also cap the rate each time it’s up for an adjustment. For most loans, that limit is a 2-percent increase each six months or one year. Each monthly amortizing mortgage payment includes both interest and principal, the amount of money you borrow from the lender. The term “amortization” comes from the French word “mort,” which means death or dying. Every time you make a mortgage payment, a portion of your debt is “dying” – and thankfully so! Interest is the price the lender is charging you for borrowing money. Each mortgage payment on an amortizing loan includes some interest. Provided your loan has a fixed rate, your mortgage payment should stay the same each month. However, your initial payments go primarily to interest. Then toward the end of the loan’s term, the payment goes mostly to principal. By contrast, some loans come with the option to pay only the interest each month – at least initially. Interest-only payments come in significantly lower than amortized payments with the same interest rate because they don’t include any principal repayment. Interest-only mortgages also offer flexibility: You can choose to pay the lender only the interest owed, or you can pay principal as well. However, interest-only mortgages require borrowers to begin repaying principal at some point during the life of the loan, usually after five or 10 years. Monthly payment includes interest and principal. A portion of the loan is repaid each month. Required monthly payment goes towards interest, not principal. Because they do not include principal, interest-only payments are lower than amortizing payments. Lending can be a risky business. That’s why your loan’s interest rate rises or falls based on the lender’s perceived gamble. One of the primary ways lenders assess that risk is by looking at occupancy. Lenders provide the best interest rates and terms for owner-occupied properties because they assume that borrowers who live in a home will do whatever it takes to keep up with mortgage payments — and keep a roof over their heads. How does a property qualify as owner-occupied? The buyer has to move in within 60 days of closing. If it’s a refinance, the borrower must already live in the property. And for two- to four-unit buildings, borrowers have to occupy at least one of the units as their primary residence. But the good news is you can still qualify while renting out the remaining units. Interest rates and terms available for the purchase of a vacation (second) home are, in most cases, the same as for a primary residence. But depending on your loan amount, the lender may require a heftier down payment than for a primary residence. For example, current conforming guidelines for Fannie Mae require a 40-percent down payment if you’re borrowing more than the traditional conforming limit of $417,000 and up to the larger (high balance or agency jumbo) loan limit of $625,500. Freddie Mac guidelines, however, are more lenient and allow for a smaller down payment. In addition, Fannie Mae and Freddie Mac generally require that a property must be at least 35 miles from your primary residence to qualify as a second home rather than a rental. But that number’s a bit more flexible in the Bay Area, where a San Francisco resident may own a second home in Napa or an Orinda homeowner may want a pied-à-terre in the city, for example. Finally, two- to four-unit properties cannot qualify as second homes. Lenders consider any property that’s not a primary residence or second home an investment property. “Non-owner occupied properties,” as they’re also known, generally require a larger down payment and higher interest rate because lenders perceive them as a riskier proposition. Property will be borrower’s secondary residence. Interest rate usually the same as for a primary residence, but underwriting guidelines are slightly stricter. Borrower will not reside in property. Property is considered a rental. Interest rate and terms will be less favorable than for a primary residence or vacation home. In the lending world, we make a basic distinction between commercial and residential loans. Any property with one to four residential units is considered residential. Properties with more than four residential units qualify as commercial, as do all properties not intended for residential use, such as office buildings, warehouses, and shopping centers. The information that appears on my website applies to residential lending only. Property type also affects your loan options because different kinds of residences carry more risk for lenders. Mortgages for single-family homes generally land the lowest rates and best terms, simply because they’re a safer bet for lenders. Unlike condominiums, single-family homes are freestanding and usually remain free from homeowner’s association guidelines. Because single-family homeowners may modify and decorate their property as they like, subject only to local zoning ordinances, lenders can resell a foreclosed home with fewer restrictions to a larger pool of buyers. This makes them less risky than other types of property. Most condominiums are single-family residences that share walls and amenities with other units in the building. Other condominiums are freestanding but located within a condominium community. In both cases, homeowners associations, or HOAs, govern these communities according to a set of rules in the Covenants, Conditions, and Restrictions document, or CC&R. An HOA may ban pets or control minor details like what kind of curtains are allowed – forget the purple cow print! The HOA also has the ability to act on behalf of owners in disputes. In newly constructed condominiums, it’s not uncommon for the association to sue the property builder for defective workmanship. Those additional restrictions and the prospect of litigation make lenders see condos as riskier than single-family homes. Should the lenders take back a property due to nonpayment, CC&R rules may limit their ability to sell or rent it. Interest rates and terms for condominiums are the same as for single-family homes with one notable difference: If you need to borrow a loan amount within the high-balance conforming range ($417,001-$625,500), you’ll have to put down 25 percent to get the same rate as you would with a 20-percent down payment on a single-family home. Otherwise, your interest rate will climb a bit higher. Conforming loan limits for two- to four-unit properties run higher than those for single-family homes or condos. This means you can still get a conforming loan for a property with two to four units that wouldn’t be available for a single-family residence of the same price. Lenders view two- to four-unit buildings as riskier than other property types and charge higher interest rates, while underwriting stricter guidelines. Even if one unit in such a building is owner-occupied, the others will likely be rentals. Since apartments often remain vacant, the property owner could lose rental income and miss loan payments. And because loan amounts tend to be bigger for two- to four-unit properties, the potential losses are greater. Only a small set of lenders deals with mixed-use properties, with interest rates and terms resembling those of commercial mortgages more than residential loans. It’s usually not possible to get a 30-year fixed mortgage; only ARMs are available, and they may come with prepayment penalties or origination fees. 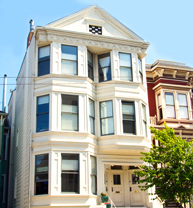 Extensive information about this uniquely San Francisco property type is available here. Lenders prefer that you invest your money alongside theirs to share the risk. If you don’t make a down payment and fall behind on the mortgage, you can walk away from your home without loss. That’s why the size of your down payment will impact your loan terms and your interest rate. The possibility of buying a home without a down payment evaporated with the mortgage crisis. While lenders always require that you contribute something, a smaller down payment will come with a higher rate of interest and more restrictive guidelines. Even before the 2008 financial crisis, 20 percent down was the industry-standard minimum for both conforming and jumbo loans. Putting down less than 20 percent negatively impacts the interest rate and narrows your options. And borrowers who need jumbo financing generally can’t get away with a down payment of less than 20 percent. Depending on the type of property you’re financing, a larger down payment may improve your interest rate. While 40 percent is the industry-standard minimum for landing a lower rate, 25 percent down will get you a better rate on conforming loans, particularly if you’re buying a condominium. On the other end of the spectrum, a 10-percent down payment is possible but requires a second loan. Below are the standard minimum down payments and their impact on rates and options for your mortgage. Lender provides financing for 60 percent of the property’s value. You’ll receive a better interest rate in exchange for making a large down payment. Lender provides financing for 80 percent of the property’s value. Allows for the best interest rate and terms for a single-family home. Also available for condos, but the interest rate will be higher. Lender provides financing for 75 percent of the property’s value. Allows for the best interest rate and terms for a condominium. Minimum down payment required for a two- to four-unit property. Lender provides financing for 90 percent of the property’s value. For borrowers who can’t contribute more than 10 percent. Requires mortgage insurance. Not available on two- to four-unit properties. It’s becoming more common for buyers to receive financial help from family members when purchasing their first home. As long as you meet the minimum requirements for your loan, you may receive gift funds from family to round out your down payment. However, be prepared to show the lender a “gift letter” detailing the donor’s name and familial relationship to you, as well as the gift amount. The letter should also state that you don’t need to repay the money. In addition, lenders require that buyers using gift funds to partially finance a standard 20% down payment contribute at least 5 percent of their own money. For example, if you’re making a 20% down payment and receiving 15% of the gift, the other 5% must be from your own funds. However, those who are lucky enough to receive 20 percent or more of the purchase price as a gift needn’t put any of their own cash down. They will, however, still need their own money for closing costs and the other expenses associated with buying a property. In expensive markets like ours, second loans are essential for many buyers. A 10-percent down payment on an $850,000 property still represents a significant amount of money. A second loan can bridge the gap between a first loan and the funds you have available for your down payment, allowing you to buy a more expensive property. Second loans are available for up to 90 percent total financing of the property — you can get a first loan for 80 percent of the home’s value and combine it with a 10-percent second loan for 90-percent total financing. Your down payment would then be 10 percent. Buyers often opt for second loans when they need to borrow more than the conforming or high-balance conforming loan limits but want to avoid a jumbo loan with a higher rate. If you buy a home for $850,000 and want to make a 20-percent down payment, you’ll need to borrow $680,000, a jumbo loan amount. But to get the best rate, you’ll want to limit your first loan amount to the high-balance conforming loan limit of $625,500 and take out a second loan of $54,500. Similarly, if you need a loan amount just over the conforming limits of $417,000 or $625,500, you could take a second loan to bridge the gap. This would land you the best rate possible for the first loan by limiting it to the traditional conforming maximum instead of accepting a heftier rate for a high-balance conforming loan. A second loan waits in the wings in “second position” behind your first loan. Essentially, the lender has agreed to subordinate its lien to the first loan lender. If you’re unable to pay your mortgage, the first lender has the right to sell your home to recover its losses. But the second lender receives compensation from the sale only after the first lender gets its payment. For this reason, lenders view second loans as riskier, requiring higher interest rates and more restrictive underwriting guidelines. Fixed second loans are amortizing loans. That means each payment includes both principal and interest. As the name indicates, fixed second mortgages have an interest rate that’s fixed for the entire term — usually a 30-year period — with the principal repayment schedule calculated over that timeframe. Rates for fixed second loans run significantly higher than those for first loans and depend on a number of factors, including loan size, the total amount of financing needed as a percentage of property value, and your credit scores. Lines of credit, also called “home equity lines of credit” or “HELOCs,” are adjustable and initially include only interest rather than principal payments. The interest rate is based on a margin over the “prime” rate of interest, the rate the Federal Reserve charges member banks to borrow money to meet withdrawal demands. Prime is the index lines of credit are based on. Prime rate changes affect the interest rate of home equity lines of credit, which usually allow you to borrow money and make payments of interest for the first 10 years of the loan. After that, the lender requires principal repayment. One advantage of a line of credit is that even if after paying the lender back, you can still draw money on the line in the future. This makes it a very effective cash management tool. Interest rate fixed for 30 years. Monthly payments include interest and principal. Payment is fixed but rates are significantly higher than for first mortgage financing. Interest rate may adjust on a monthly basis. Required monthly payment goes towards interest, not principal. Interest-only payments are lower than amortizing. Lines of credit can be paid down or drawn upon as needed. Most people have been coached to ask if a loan has a prepayment penalty when they are researching mortgage options. However, I cannot think of any lender currently offering residential financing that includes a prepayment penalty on its loans. None of the loans I am able to offer through my mortgage bank or broker sources have prepayment penalties. If you do come across a prepayment penalty on a loan, it’s probably only in effect for the first year or less and generally applies only to adjustable-rate mortgages. Although prepayment penalties are best avoided, you may be given the option to accept one to get the kind of loan you want. Lenders require the penalty to guarantee they will recoup a minimum investment on your loan by receiving interest for the specified timeframe. A typical prepayment penalty is either 20 percent of the loan’s outstanding balance or six months of interest, whichever is less. Even so, it still may be possible to repay a portion of your loan – generally 20 percent of the balance each year — while the penalty is in effect. For most of us, our mortgage is the single biggest financial commitment we’ll make. That’s why it’s important to learn about your options and understand how lenders will view your situation when underwriting your loan.